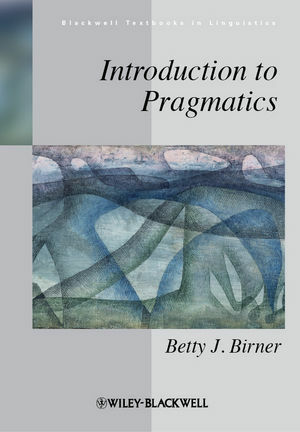 Introduction to Pragmatics guides students through traditional and new approaches in the field, focusing particularly on phenomena at the elusive semantics/pragmatics boundary to explore the role of context in linguistic communication. Betty J. Birner is Professor of Linguistics in the Department of English at Northern Illinois University. She is the author of several books, including The Discourse Function of Inversion in English (1996), Information Status and Noncanonical Word Order in English (with Gregory Ward, 1998), and Drawing the Boundaries of Meaning: Neo-Gricean Studies in Pragmatics and Semantics in Honor of Laurence R. Horn (with Gregory Ward, 2006).